A key part of the legacy of a creative momentum project is the evidence developed to shape future creative sector policy and support programmes in the partner regions. As part of the project, National University of Ireland, Galway has worked to analyse the creative sector and prepared a series of policy reports. Here we focus on some of the key messages from two of our reports focused on Västernorrland in Sweden. An OECD Territorial Review of Västernorrland reports the region has a low population density of 11.3 people per square kilometre and most of the population is concentrated in the city of Sundsvall. The region also has an ageing population and trends over the longer term show population decline. Västernorrland’s economy has a tradition of heavy industry. In recent years it has become specialised in the forestry and processing sector and diversification into new products and markets is increasing its competitiveness. Business services, such as financial and insurance, as well as IT have experienced recent growth. Tourism is also a growing sector that can capitalise on its marine amenities, good accessibility and relative proximity to Stockholm. A distinctive granite landscape and old growth forest distinguishes the High Coast area, a UNESCO World Heritage site, which is an important part of the cultural and natural landscape of the region. Another less well recognised industry sector in Västernorrland are the creative industries. Our analysis for a creative momentum project estimates there are around 2,763 creative sector enterprises employing 4,070 people in the region. We estimate the total value of the sector at 325.9 million SEK and exports at 18.4 million SEK. Our findings are based on data from Statistics Sweden and our own survey of creative sector enterprises. Looking to the future, prospects also look bright. Based on data reported by our survey respondents, we predict an 8% growth in employment up to 2020. The impact of the creative industries in Västernorrland goes beyond their direct economic value. Our research indicates that an adaptable multi-skilled workforce exists in the creative sector. For example creative entrepreneurs can supplement their main creative practice with teaching and passing their skills on to others. Cooperative relationships between creative sector enterprises are important and entrepreneurs are supportive of each other which helps the sector to develop. 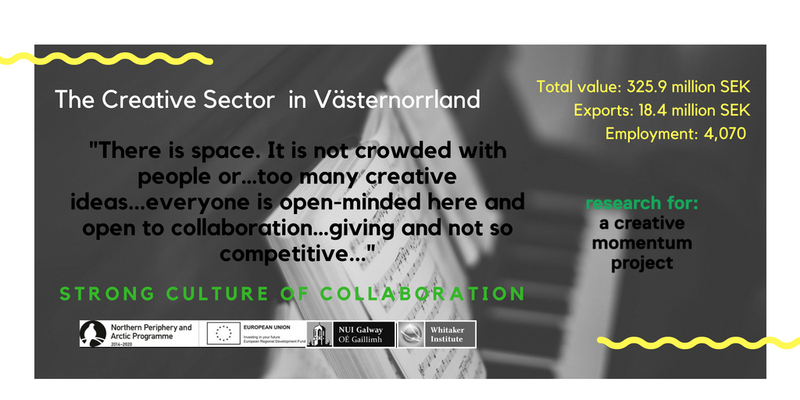 Västernorrland’s creative sector is also socially embedded in communities and we found the activities of creative sector enterprises can also cross-over into the community sector. 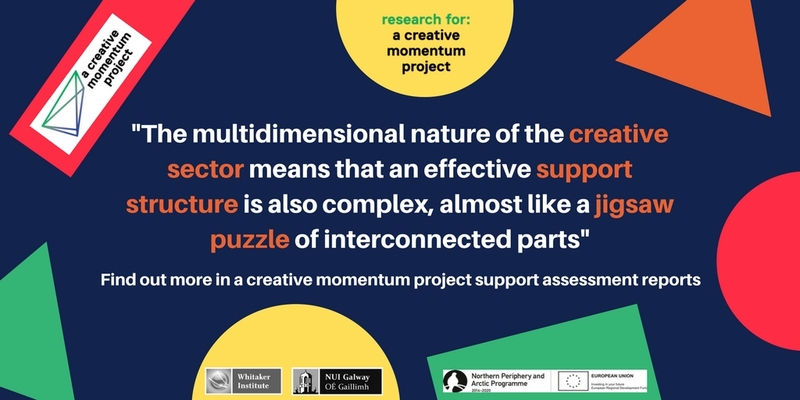 To help support the future development of the creative sector in Västernorrland, a creative momentum project has assessed creative sector support needs. Existing funding supports are a core part of the region’s support structure, but a range of needs also emerge from our analysis. Our evidence highlights a core challenge for creative sector business sustainability is building a balance of revenue streams. To assist access to new markets, we suggest a range of measures such as support for attendance at trade fairs and industry networking events, as well as development of intermediaries to facilitate new market access. We suggest local policymakers look at the potential for new support measures, such as a regional fund to support leading creative professionals to focus on their creative practice full-time, a creative entrepreneurship training programme and the potential for a dedicated creative enterprise incubator in the region.